This isn't true for older workers: while women's labor force participation has risen dramatically over the past half century, the difference between overall male and female employment rates is still about 10 percentage points. During the current recession, however, younger workers have seen that gender gap disappear. Above is a picture of monthly employment rates for young men and women -- the proportion of those between the ages of 16 and 24 who had jobs. Where the two lines in the picture cross, in late 2009 and early 2010, employment rates for both groups became essentially the same. During the 1950s, around 65 percent of young men were employed, compared to about 40 percent of young women. Huge increases in female labor market participation in the 1960s and 1970s more than halved the employment gap. By the late 1990s, additional employment of young women brought the gap to less than 5 percentage points. Employment opportunities shrank for both young men and women after the recession of 2001, and during the current recession, employment for young men plummeted faster than for young women. Why did the employment gap disappear for younger workers but not for older ones? One reason is that the housing bubble burst in 2006-2007 and took construction jobs with it. Many of those jobs were held by young men. During the peak of housing bubble, about 13.7 percent of employed males, young or old, had jobs in the construction industry. In 2009, that figure had fallen to 12.2 percent for older males, but to only 9.2 percent for young males. Female construction employment fell too, of course, but less than 2 percent of females had construction jobs even during the bubble. Now suppose we magically added those lost construction jobs back into the 2009 economy. Not much would change for female employment rates. They would stay the same at 55.8-55.9 percent for older women, and at about 47.0-47.3 percent for younger women. Older male employment rates would rise from 68.1 percent to 69.6 percent, but young male employment would jump from 46.7 percent to 50.0 percent. 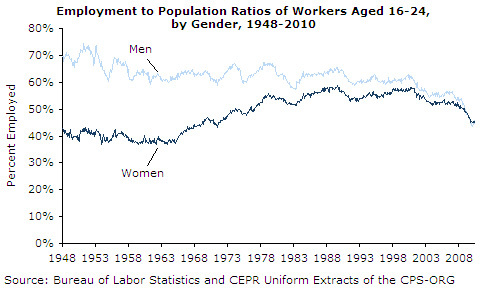 That is, the young male employment rate would rise from being about the same as to well above the female rate.